What do the words “the shedding of blood” refer to? It is understood that our battles must resemble those of our Master and King, our Beloved Jesus who we seek to be transformed into the likeness of, after we have fought to the best of our human capabilities in learning to do God’s will by surrendering up with great joy in the Spirit our self will (the flesh – the “old man,” Ephesians 4:22) and doing so until our last dying breathe or else until our last conscious moment of existence in the flesh. Our consecration vow of following in Jesus’s footsteps isn’t just for a season but for however long our Creator wishes us to be trained in the School of Christ for and each day is another chance to improve, to develop our weaknesses so they become our strengths. Each day is a new opportunity to prepare ourselves like young Esther did, to be found worthy of becoming the Bride for Christ. It means actually going through experiences of suffering for righteousness sake (Matthew 5:10-11, 1 Peter 3:14)… suffering in our battles to overcome evil with good and to do how our Heavenly Father would want us to, in order to please Him. It means enduring with cheerfulness in the hope set before us and mortifies the deeds of the flesh (Colossians 1:11, 2 Peter 1:6). By resisting unto death, it must cost us our ALL to be faithful to the truth and righteousness, and our Heavenly Father seeks such as will be “faithful until death” (Revelation 2:10). If it be the surrendering up of fleshly interests, or perhaps careers or prestige or positions of authority, or reputation, then one will thank God for all the experiences endured patiently with great joy in the precious promises of the Bible, seeking more and more, day by day, to clean out in ourselves what needs to be cleaned, relying on the strength of the Lord to renew the new mind in Christ (2 Corinthians 4:16). Let us surrender to the experiences God may allow upon us as HIS PLANS ARE PERFECT (Psalm 18:30). Consider opening up the Bible and just for this exercise focusing on all the precious promises in the Bible. You will be transported into another world in your mind, if you focus on the joy in Christ which God’s people can now have through faith in Christ. Let us focus moment by moment on overcoming the challenges that would help make God as well pleased as is possible with the time that remains in our lives. It is good to remember that DIVINE TIME is not HUMAN TIME. So let us patiently endure all the testings of our Faith, striving to develop the kind of patience that God has toward us (2 Peter 3:9) and in our daily imperfections of the flesh. not just when it’s most comfortable to do so. It requires discipline, determination, zeal and a lot more which can be acquired through study and prayer. Positivity is required by a soldier of the Cross to fuel their zeal in climbing and not resting then longer than they need on a plateau. If you long to be in a place where we can one day be found by God’s grace, in the most responsible positions that our Heavenly Father would trust us to be in, then we must go through many trials and experiences now without wavering or complaining (Psalm 34:19). The narrow way trodden by the footstep followers of Christ is not an easy way, yet it is the MOST JOYOUS PATH because of the Hope we have IN CHRIST! There is only enough room on it for ONE and JESUS at a time, hence it is called a NARROW way. IT IS POSSIBLE to achieve the crown of life if one seeks it with their whole heart and continually asks God for help, for God’s grace and mercy. Which teacher would not help their student who is asking for help? “4 Delight thyself also in the Lord: and he shall give thee the desires of thine heart. 5 Commit thy way unto the Lord; trust also in him; and he shall bring it to pass” (Psalm 37:4-5). In this parable, Jesus told the young rich man that to enter the Kingdom of Heaven, he needed to disentangle himself from his wealth first like you would have to unload all that was on a camel’s back to get through the eye of the needle. Unfortunately, the young rich man in the parable was not willing to unload his back and he missed out on what his heart was looking for. The photo above of a similar gate in Nazareth illustrates the eye of the needle gate quite well. 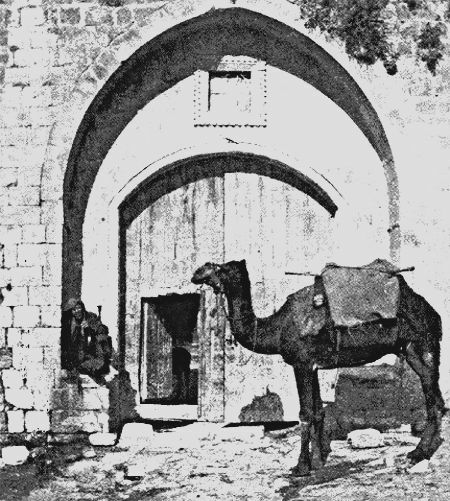 You can see that a camel could not pass through the gate unless it first had all its baggage removed and then stooped to get through the gate. This discipline in faithful patient endurance to achieve victory in Christ and be one of the Bride will require the surrender of ALL and it is worth every and any earthly pleasure/comfort gladly surrendered up now in order to belong to Christ and bring joy to our Heavenly Father by OVERCOMING the flesh, the world and the Adversary! “Be watchful (alert), stand firm in the faith, act like men (courageous, be brave), be strong” (1 Corinthians 16:13). – to increase one’s faith, trust in God’s power? – to place full confidence and reliance on God’s strength working through the carnal flesh as the New Mind in Christ matures into Christ ? – to not fear what the world fears? – to discern God’s will? God teaches us uniquely individual lessons hence it requires very careful listening to the voice of God which comes from walking closely with Him and learning His principles and HIS ways. “The one who says he resides in God ought himself to walk just as Jesus walked” (1 John 2:6). Other Holy Scriptures about walking with God include: Micah 6:8, Deuteronomy 8:6, Romans 13:13, Ephesians 2:10, John 4:32-34, Hebrews 10:22, Luke 10:27, Romans 8:29, Philippians 1:6, 2 Corinthians 5:7, 1 John 1:6-7, Galatians 5:16, John 8:12. “Consider him who endured from sinners such hostility against himself, so that you may not grow weary or fainthearted. 4 In your struggle against sin you have not yet resisted to the point of shedding your blood. 5 And have you forgotten the exhortation that addresses you as sons? 9 Besides this, we have had earthly fathers who disciplined us and we respected them. Shall we not much more be subject to the Father of spirits and live? 10 For they disciplined us for a short time as it seemed best to them, but he disciplines us for our good, that we may share his holiness. 11 For the moment all discipline seems painful rather than pleasant, but later it yields the peaceful fruit of righteousness to those who have been trained by it. GOD’s Truth is THE MOST PRECIOUS thing we own now. Let us GUARD IT and PROTECT the mind in Christ because the devil roars around like a lion wanting to deceive whomever he can. “Cast all your anxiety on Him, because He cares for you. Be of sober spirit, be on the alert. Your adversary, the devil, prowls around like a roaring lion, seeking someone to devour. But resist him, firm in your faith, knowing that the same experiences of suffering are being accomplished by your brethren who are in the world” (1 Peter 5:7-9). Dear friends, every spiritual help and assistance we receive are parts of the Father’s good providence for us whereby we shall be the stronger in the spirit, the more courageous, the better prepared for further trials, besetments, difficulties and conflicts with the world, the flesh and the Adversary. But when we reach the glorious condition mentioned by the Apostle, all the trials and testings will be in the past. Then finally for us there will be no more sighing, no more crying, no more dying, no more fightings, no more crosses, no more sufferings, but instead, life eternal, joy eternal, glory, honor and immortality at our dear Redeemer’s right hand of favor. Let us console ourselves with the thought that whatever is God’s will concerning us must necessarily be for our highest welfare and best interests. If, therefore, it is not yet time for us to pass beyond the veil, it is because our Heavenly Father and our Redeemer have a work for us to do in the present life–either a work of further polishing upon our own character or a work of helping the brethren, or both, for we remember the declaration that Christ’s Bride is to make herself ready for that event. We are to build one another up in the most holy faith, encouraging, strengthening, sympathizing with and assisting one another in running the race for the great prize. “I will never leave thee nor forsake thee” (Hebrews 13:5). “My grace is sufficient for thee, for My strength is made perfect in thy weakness” (2 Corinthians 12:9). “If we suffer, we shall also reign with him” (2 Timothy 2:12). “And if children, then heirs; heirs of God, and joint-heirs with Christ; if so be that we suffer with him, that we may be also glorified together” (Romans 8:17). May we not lose heart and flee from the battle, but rather, as a company of good soldiers who have been refreshed and encouraged and stimulated, we will return to our duties full of good courage, full of joyful anticipation of the coming Great Home-Gathering of the Church of the Firstborns; full of renewed determination that by the GRACE OF GOD, and with the assistance of our great Advocate, Jesus Christ, we will make our calling and election sure by so running in His footsteps as to receive the great Prize which Our Heavenly Father has offered to us. Posted on March 31, 2016 June 5, 2018 by Bible Students DailyPosted in Inspiring Gems of Truth & BlogTagged #1Corinthians 9:25, #fight the good fight of faith, #strict training, 1 Corinthians 13:1-2, 1 Thessalonians 2:19, 1 Timothy 6:12, agape, be spiritually minded, Bible Students, Bible Students Daily, Bride of Christ, consecration vow, determination, discipline, Faith, glory honor and immortality, Hebrews 12:3-17, Hebrews 13:5, high calling, life eternal, Nazareth, no cross no crown, one divine hour, our christian warfare involves, positivity in Christ, Precious promises of God, Romans 8:28, shedding of blood, suffering for righteousness sake, surrender, the eye of the needle gate, the most precious thing we owe, transformed into the likeness of Christ, wear the full armor of Christ-likeness. Previous Previous post: Who is the World’s RANSOM and Why?